Among all our animal cousins we humans are unique in being able to grasp, and develop, abstract mathematics. How this ability evolved is something that has intrigued psychologists and anthropologists for a very long time. One possibility is that high-level maths ability builds on a sense of number, space and time that is hard-wired into our brains from birth, and which we share with many animal species. Another is that it piggy-backs on our faculty for language: when we think about complex maths we borrow some of the tools we have evolved for understanding and constructing language. We are all born with a sense of number and space. Researchers have been hotly debating these two possibilities, but a recent study appears to have laid the question to rest. 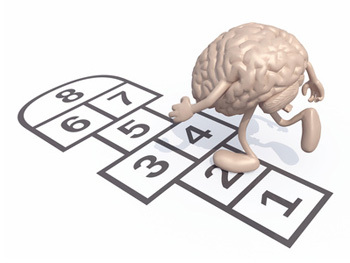 By scanning the brains of professional mathematicians, researchers in France have found evidence that it's the innate "core knowledge" of number and space, rather than language, that is behind our ability to do high-level maths. It's not the first study to show that maths can happen without language. As we have reported on Plus, previous studies with Amazonian tribes that haven't developed words to describe numbers or geometric concepts, and with people who have lost their language ability through brain damage, showed that these people could still complete mathematical tasks. The tasks they had been given in these studies, however, were very basic. The ability to do really difficult, high-level maths may well be unrelated to the basic maths ability we all have — and it may require language. It's also possible that maths straddles several faculties: more visual areas, such as geometry and topology, might require different brain functions than something like algebra that is more akin to language. To settle the question, Marie Amalric and Stanislas Dehaene used fMRI scans to look at the brains of fifteen mathematicians, as well as fifteen non-mathematicians of the same academic standing. They gave their subjects mathematical and non-mathematical statements, and asked them to decide quickly whether the statements were true, false, or meaningless. The mathematical statements were equally divided between the areas of analysis, algebra, topology and geometry. Using the fMRI image, Amalric and Dehaene observed which areas of their subjects' brain were activated as they completed their tasks. The researchers found that when the mathematicians (but not the non-mathematicians) contemplated high-level maths, brain areas became activated that don't overlap the areas we use to process language. Instead, the high-level maths used areas associated with our basic, hard-wired understanding of number and space. The researchers also didn't find any evidence that the relationship between language and maths depends on the area of maths under consideration. This does appear to settle the question about the relationship between language and maths, but it raises a new one: if high-level maths ability builds on an innate sense that we all possess, then why do so few of us go on to become top, or even just adequate, mathematicians? It's a question the researchers suggest should be probed further. The evolutionary link between basic counting and lofty mathematical abstraction is still a mystery.